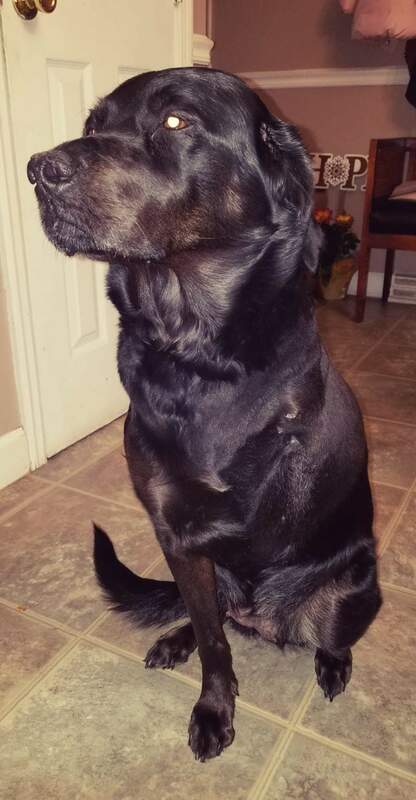 Luna, an 11 year old shepherd mix, had a large mass (larger than a golf ball) between her toes in the left front leg. WARNING – WHAT FOLLOWS IS GRAPHIC – YOU HAVE BEEN WARNED. Actually, the mass got much smaller suddenly, after she literally chewed up half of it. That left a large open wound, which got infected, and caused a horrible smell. Luna was limping because of the severe pain this mass caused. Her family vet did a needle test (“fine needle aspirate”), which came back normal or as we say “inconclusive”. So there was nothing to worry about right? It was likely a benign mass after all. Amputation was mentioned, but Luna’s loving owner could not accept the idea. She thought it was a horrible idea and Luna would be miserable. She found me through my website, reached out to me, and we had a little heart to heart. I explained my concern that this was not a benign mass at all, and that amputation was the only reasonable option. 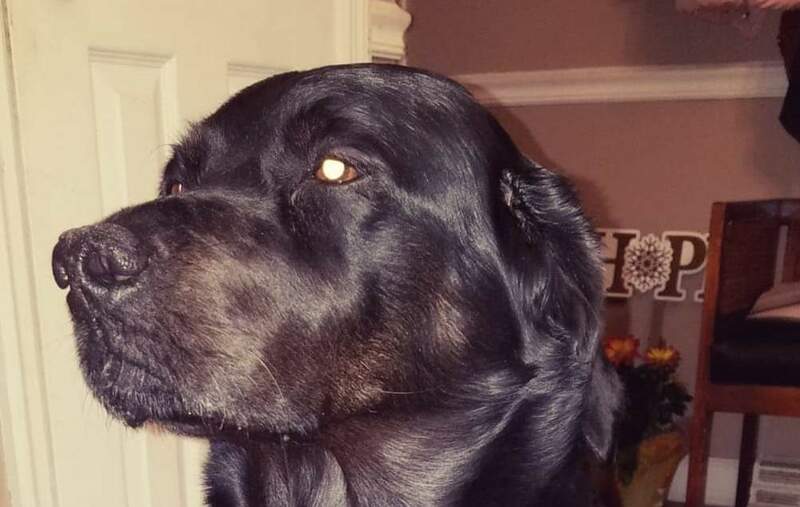 After agonizing over this difficult decision, Luna’s owner eventually agreed to do the right thing for her beloved dog and scheduled the amputation. But first, we needed to take chest X-rays, because the cancer I suspected typically spreads quickly to the lungs. Fortunately, no spreading was visible at that point. We performed the amputation (let’s call it day 1) and surgery went smoothly. Luna went home that night – walking. Below is a summary of what happened after surgery, to give you a feel for the emotional roller-coaster Luna’s owner went through. Day 1: surgery was performed. Luna went home and had a rough first night. Of course, Luna’s owner questioned her decision. Day 2: I recommended adding a third pain medication. Day 3: One of my nurses called to check in. Luna felt much better already. Day 6: The biopsy results came back. The news was not good. As expected, the mass was indeed cancerous. It’s called malignant melanoma. So what is the purpose of this blog? I’m not sharing this story to brag. And I am not here to try to convince you that amputation is a wonderful thing and a walk in the park (no pun intended) . What I would like pet lovers to believe is that when we recommend sacrificing a leg, it’s never for fun. It’s always to help a cat or a dog feel better, once the source of the pain is removed. The biggest obstacle is most often in the pet owner’s mind. They are often terrified that amputation is cruel. I suspect that, subconsciously, they think of themselves as an amputee, walking on one leg. Well, remember, pets walk on 3 legs after amputation and they adapt very well. And typically, they start walking a few hours after surgery! Pets don’t even know they’re missing a leg, all they know if that they don’t feel the pain anymore. Why did Phoebe need a nose job? Phoebe is a 3 year old bulldog who was struggling to breathe. Her breathing was very loud and harsh. She couldn’t function without panting. She snored while sleeping. Was easily overheated. Things got progressively worse and she was nearly suffocating. She was taken to the emergency clinic where she was sedated to place a breathing tube to allow her to calm down, lower her temperature and get her oxygenation up to normal. All Bulldogs (French, English), Boston Terriers, Pekinese, Boxers and Pugs are called brachycephalic breeds (which means “short skull”). They have a short snout and a flat face. 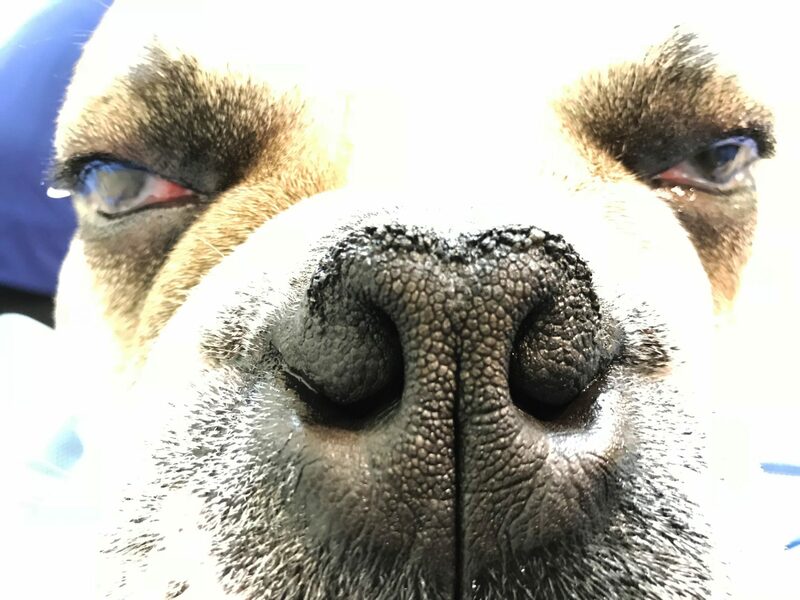 Not all brachycephalic breeds have brachycephalic syndrome, but it should be suspected until proven otherwise.
. An elongated soft palate, which means that the back of the roof of the mouth is so long that it covers the opening to the windpipe.
. Saccules are fleshy structures at the opening of the airway. 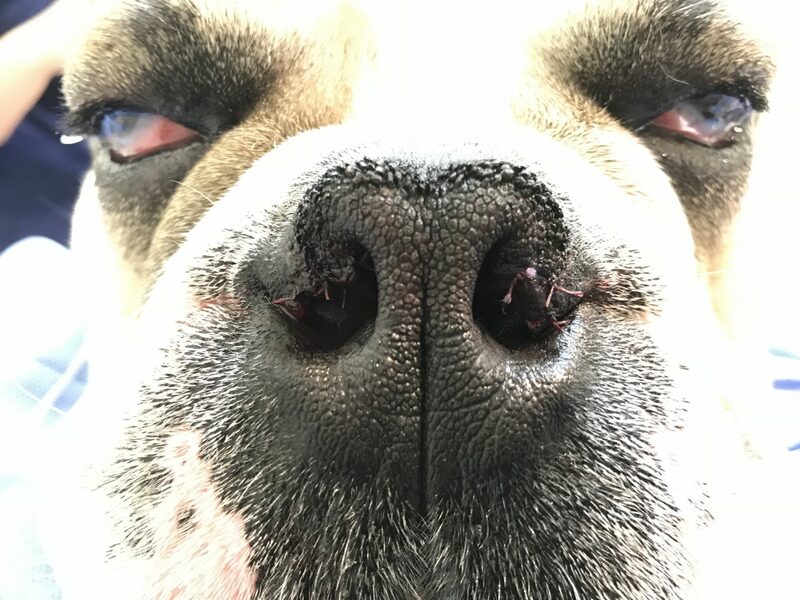 When brachycephalic breeds have difficulty breathing, over time, the saccules are mechanically pulled out into the airway.
. Stenotic nares are smaller nostrils than normal, which again prevents getting enough oxygen. There is at least one more issue: Bulldogs, in particular, have a tiny windpipe. There is nothing we can do about it, but it certainly doesn’t help these dogs breathe. We can however fix all 3 issues mentioned above.
. Her elongated soft palate was shortened.
. Her “everted” saccules were removed.
. Her almost non-existent nostrils were widened. 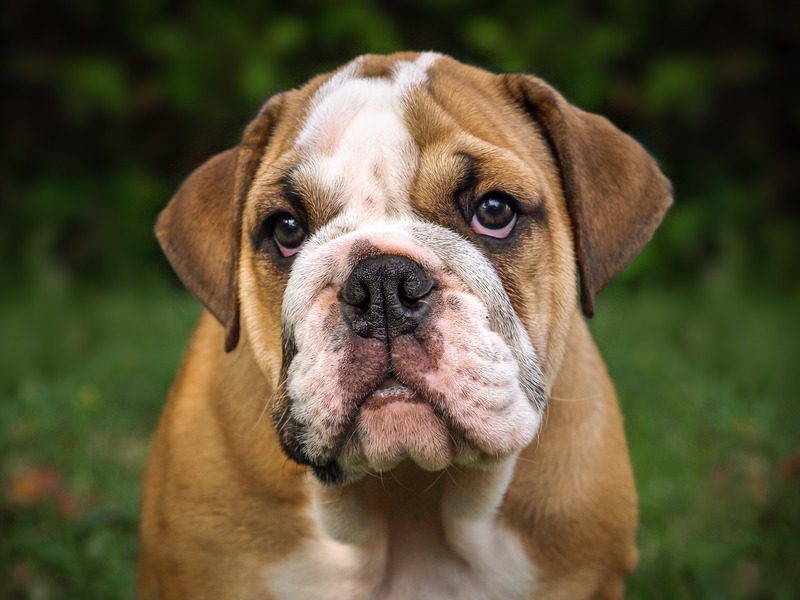 Some surgeons recommend doing a nose job on brachycephalic puppies as early as 3 to 4 months of age. Why so young? 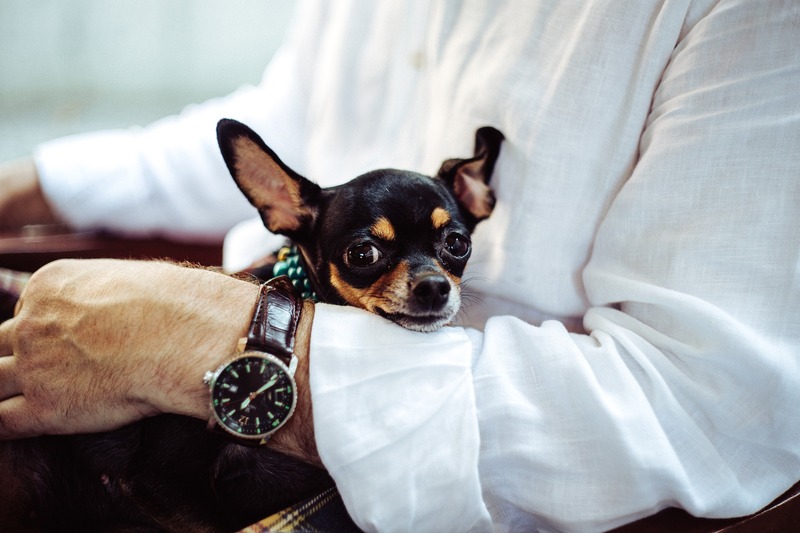 Because we hope that if we fix the nose at that age, and the dog doesn’t struggle to breathe, the soft palate and saccules may remain pretty normal. So we feel that it’s better to widen the nostrils at a young age, which is not very invasive, than to do the full 3 surgeries at a later age. At that point, there are many other additional changes that we simply cannot repair. While the pup is under anesthesia, we also recommend doing a spay or a castration. This is a great way to prevent spreading the bad genes to future generations, among many other benefits. Phoebe recovered very well after surgery. She was able to breathe much better by day and stopped snoring at night. Ironically, it also helped her owners sleep better at night. 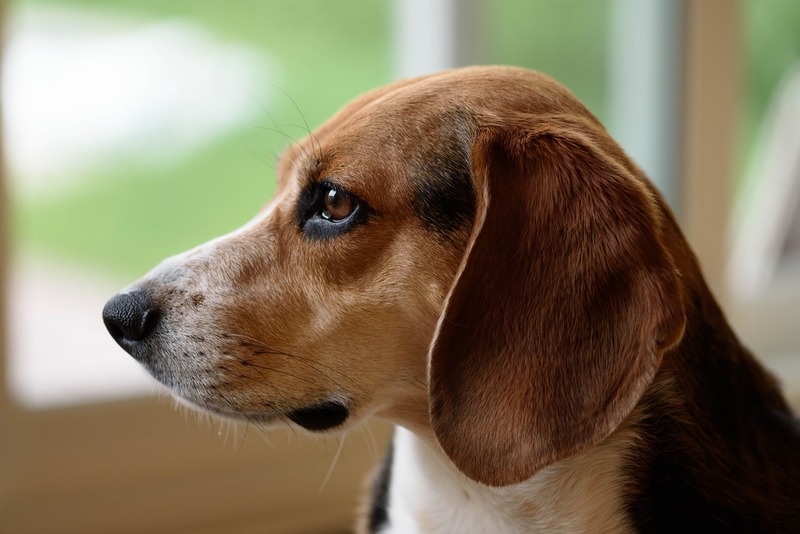 Snoopy, a cute 7 year old Beagle, was taken to his family vet because he was in terrible pain. He was unable to move his neck normally and was crying in pain. The limited range of motion in his neck and pain in one front leg (similar to a sciatica with a back problem) alerted his vet that he may have a serious condition, most likely a slipped disc. This remained to be proven. Snoopy was sent for a CAT scan. 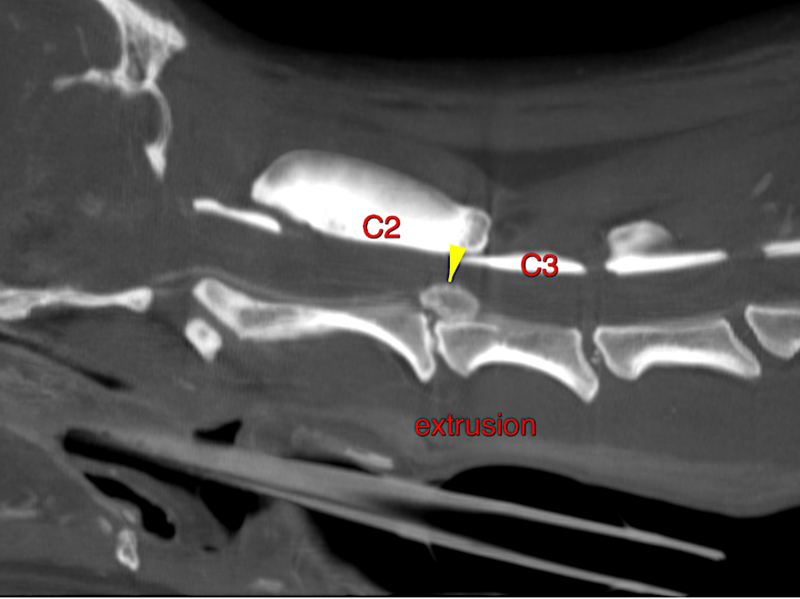 The scan revealed that Snoopy did indeed have a huge slipped disc (or disc hernia) between C2 and C3 (the names of 2 vertebrae in the top part of the neck). Based on those findings, I recommended surgery to remove the slipped disc (“ventral slot” surgery). In addition, a preventive surgery (“fenestration”) was performed to remove the center of the discs below the slipped disc. 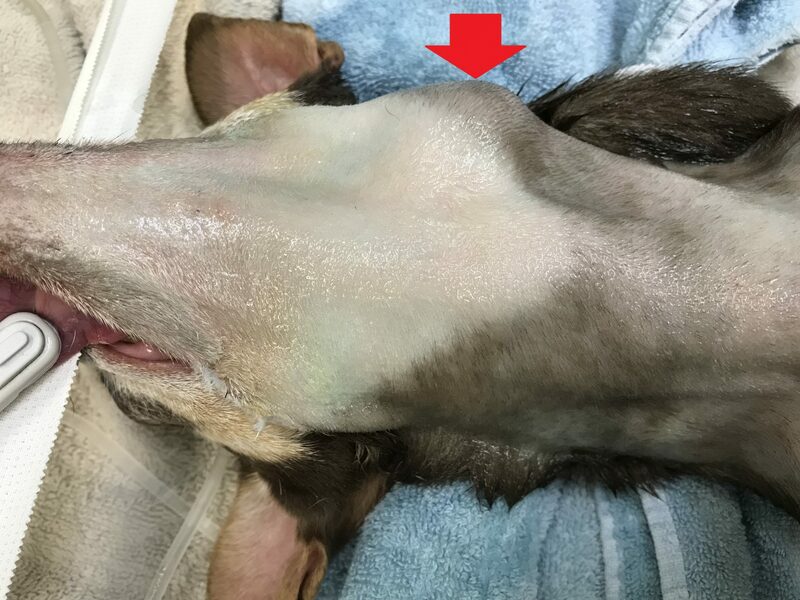 Since we physically remove part of the disc, it lowers the risk of another slipped disc in the future (in case you’re wondering why the discs above were not taken care of, this is only specific to Snoopy, whose disc was at the very beginning of the neck). Other treatments for a slipped disc can include medications (steroids – which are out of favor in 2018), acupuncture and physical therapy. For me, the best, definitive treatment is surgery. 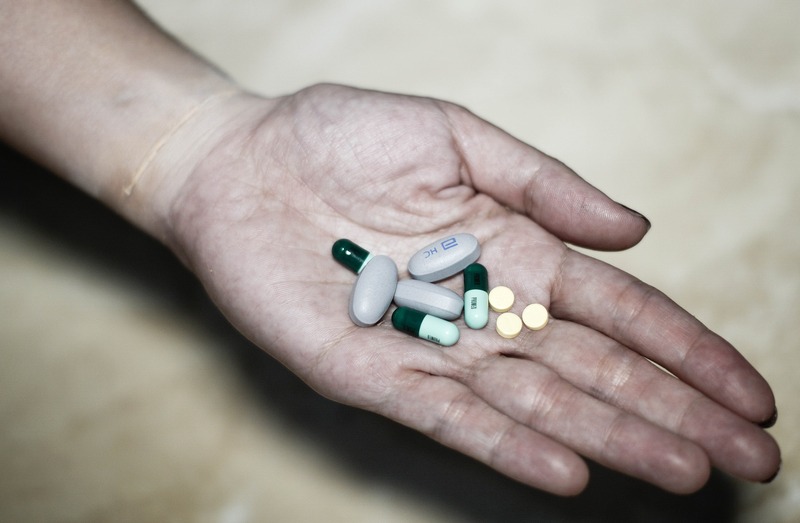 It’s like having a pebble in your shoe: you can try physical therapy, acupuncture or medications, but the only long-term solution is to remove the pebble. Look at the picture of the CAT scan again. What else, besides surgery, is going to make this huge disc go away? What else is going to stop putting so much pressure on the nerves in the spinal cord? Snoopy recovered at home uneventfully. He was confined to a small area for 8 weeks, then allowed to slowly return to his normal activity. Two months after surgery, his owner was happy to report that Snoopy was back to his normal Beagle self. 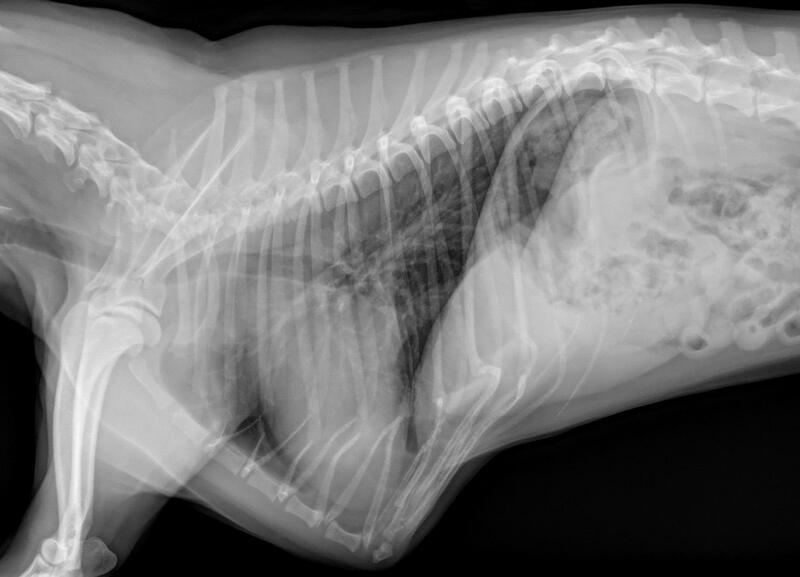 Reese, a 7 year old Chihuahua, was brought to his family vet because of raspy, difficult breathing. He had a walnut-sized mass (in an 8 lb Chihuahua!) on his neck, near the thyroid glands. Reese’s vet logically suspected that the mass was pushing on his windpipe. Surgery was recommended to remove and biopsy the mass. 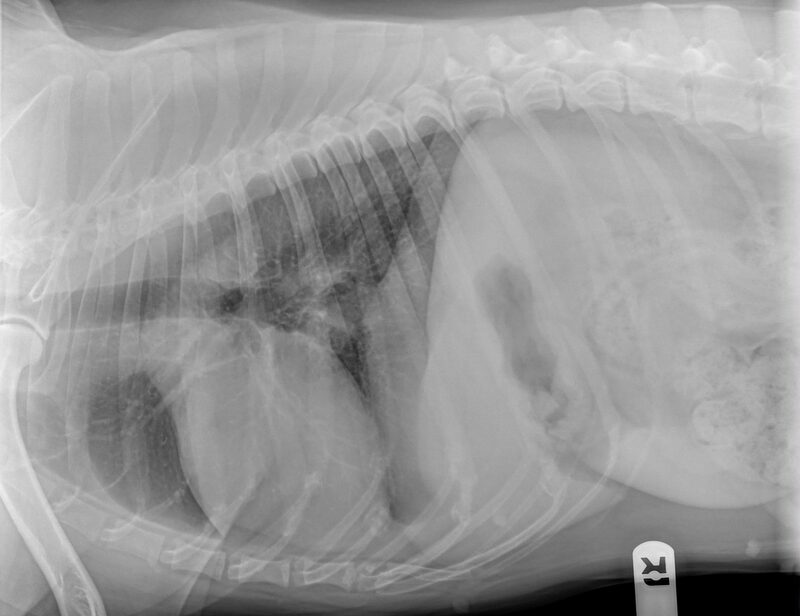 Prior to surgery, chest X-rays were taken to make sure there was no spreading to the lungs. Blood work was normal, and it was decided that Reese was a good candidate for anesthesia and surgery. Surgery was successful. Reese recovered uneventfully and his breathing improved immediately following surgery, as soon as he woke up from anesthesia. 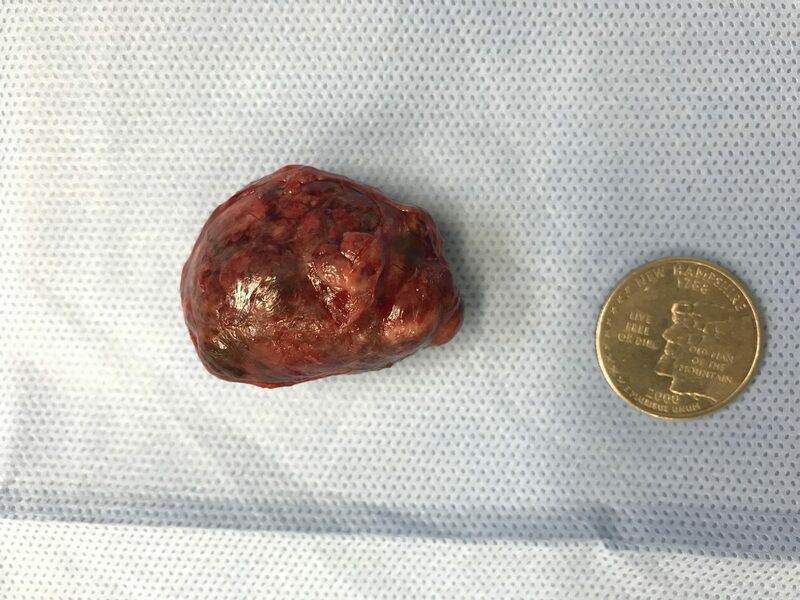 A week later, the biopsy confirmed that the mass was thyroid cancer (carcinoma), which had been removed it in its entirety. This is not a good disease, but we had bought time and improved Reese’s quality of life. 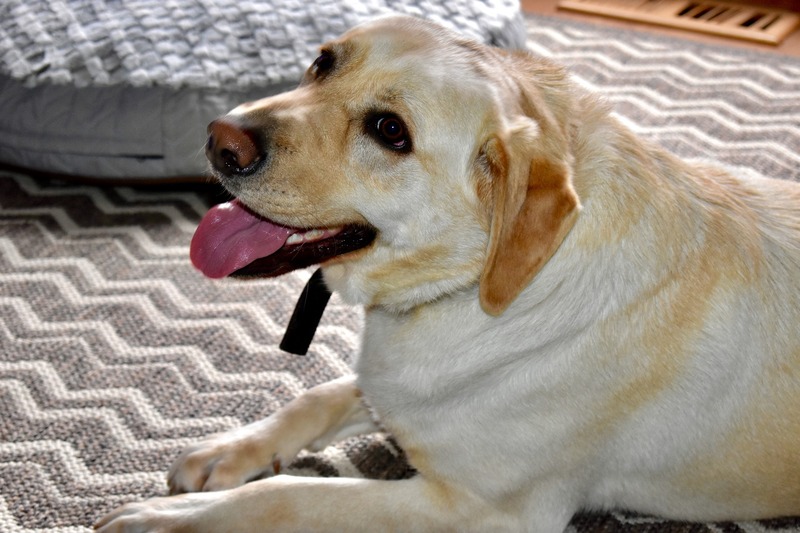 Reese’s owner was rewarded by a happy pup who can enjoy life again.